[prMac.com] New York, New York - Chromatic Bytes, LLC announces the immediate availability of ZeusDraw 1.3.1, an update to its Mac OS X vector drawing program. 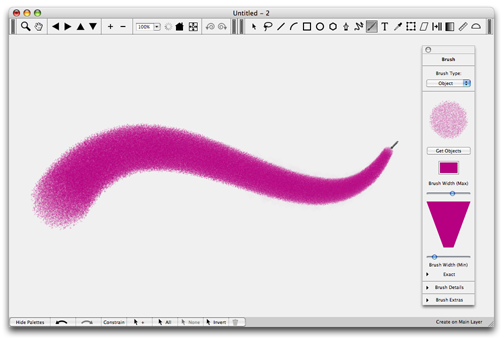 ZeusDraw offers a fluid, graceful interface, great brushes and a host of other features. This is a free update for currently registered users. * Assign Profile - Users can now assign a new profile to a document. Assigning a new profile leaves the color component values unchanged, but changes how they are intepreted. * Match Document to Profile - This allows users to match your entire document to a new color space. For example, users can use this to convert an RGB document to CMYK or vice-versa. * Bug Fixes - This release fixes a number of minor bugs including the "inverted CMYK jpeg" issue on Leopard. A 30 day free trial of ZeusDraw can be downloaded from the Chromatic Bytes web site. ZeusDraw costs $90 USD and a license may be purchased from within ZeusDraw or from the Chromatic Bytes web store. Located in New York City, Chromatic Bytes, LCC makes Macintosh software for OS X, specializing in graphic arts software.